I've only used the delicious and creamy Posh from Revlon once before, and I forgot how unbelievably beautiful it is. It totally makes this manicure something incredibly special. The half moon leopard print manicure isn't anything new (you've probably seen The Daily Nail version), but I love it with the green! The leopard print was created using the Chalkboard Nails tutorial and the colors were Sand Tropez and Case Study (Essie), and Black Onyx (OPI). It was a simple design to do, and I'm lovin it! Awesome! I love the peek-a-boo leopard print! I love this mani! So beautiful! I don't care for leopard print, but the green is awesome! I love this gorgeous green Revlon, and I love the name Posh. It calls to mind money, lots of money. Just like this manicure overall! People would pay a lot of money for this manicure! Also, this is really good green mani for October - depression awareness month. I LOVE half moon manis that have a little peek-a-boo design. It's so cute! This looks fabulous!! Totally different approach to half moons!! This is awesome! I still have not tried the half moon look, but this is a great combo!! I am in LOVE with this! The green is fantastic, and I am a complete sucker for anything leopard! I would love to try this mani!! I LOVE this design!!! It's so cute!! LOVVVVEEEE!!!!!! You just made me fall in love with these! 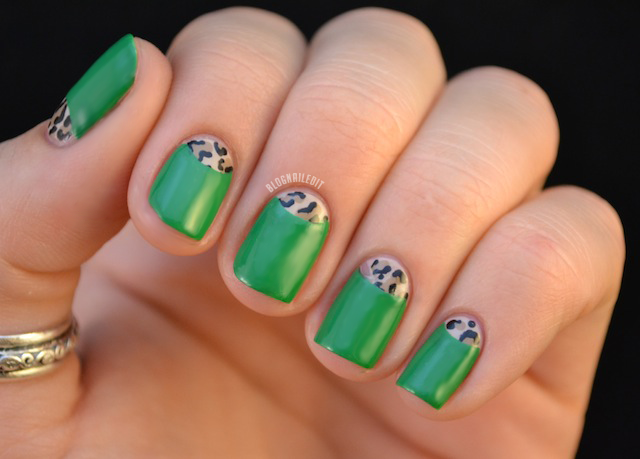 Green and Leopard print! "sigh in peace!"